A weekly tour with our expert guides so to discover deeper this land. A full immersion in its landscape, people, sounds, legends thousand years old. Arrival in Bari/Brindisi airport and transfer to Lecce. Meeting in Lecce. Bicycle delivery, Briefing about the route. Welcome dinner. Flat route, with many interesting cultural and naturalistic sights. First we visit Acaya – a fortified city with a huge castle - and then we plunge down to “Le Cesine” – a WWF protected area, crossing point for many species of migratory birds. Seafood Tasting in San Foca for lunch. From there we head to the coast, along the ruins of Roca Vecchia – an ancient Bronze age city – and ‘Alimini’ Lakes. Some more kilometers and we are in Otranto, where narrow streets reveal wonders at every corner: the San Peter church Byzantine frescoes, a walk along the ramparts overlooking the sea and finally the cathedral with his paved mosaic, a sort of figurative Middle Age encyclopedia. Exploring Otranto's surroundings. Riding along the little river “Idro” (“water”), which gave its name to the city, we arrive in Casamassela, where ancient looms are still being used nowadays at “le Costantine” foundation. After a guided tour we move towards Giurdignano, crossing a Bronze age megalithic area containing huge stones (“dolmen” and “menhir”), and we arrive at “La Cutura” botanic garden. Here ‘Toto’ will lead you through his incredible plants collection, unique in Europe for its cactus species. Then we will have a tasting lunch in a characteristic stone-made oven, enjoying typical products and local wine. Further we go back to Otranto and we are free to enjoy the afternoon in the shopping area, swimming in a little beach close to the town or making a horse ride along the cliffs at sunset (suitable also for beginners). Today we cycle along the wildest Salento coastal stretch: the ‘Palacìa’ lighthouse (far east point of Italy) and a little red lake surfaced in a disused bauxite quarry are the most interesting spots. Nestled among the cliffs above the sea, this road is a huge balcony that looks onto Otranto Strait. With a little bit of luck we will able to see the mountains of Albania and Greece. We could visit ‘Zinzulusa’ cave, going down nearly 200 feet into the earth bowels. On the way to Leuca we can also admire some terraces and dry walls, the ingenious devices of peasants to get arable land in barren and impervious areas. After crossing the bridge over the “ciolo” (a small and rich in rare flora canyon carved by the waters), we reach Santa Maria di Leuca where we visit the sanctuary, following the ancient pilgrims footsteps. 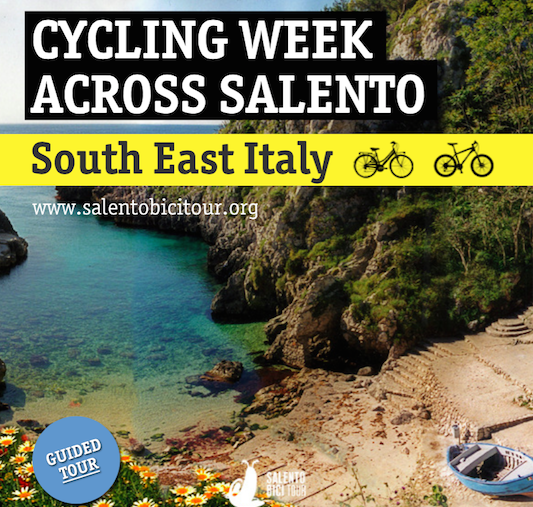 We start riding up the west coast of Salento, where rock give way to wide beaches with crystal clear water. After some km we are again in the the countryside, through olive groves and dry stone walls we'll reach a farmhouse, for a cookery class to learn how to make homemade pasta and for a tasting of organic products. Then, we'll move on to Gallipoli where we'll enjoy a rich aperitif. Located on an island, this small fisherman village is striking by its light, its alleys and its fish market. After a delicious ice cream, we ride again toward the San Mauro church: one of the hidden treasure of this country, hosting an ancient Byzantine frescoes cycle. Enjoying the sunset we cycle to Santa Caterina, a quiet village on the borders of Porto Selvaggio Natural Park. In the afternoon optional kayaking in the Park of Porto Selvaggio. This is a day dedicated to Gallipoli's surroundings. We first stop is in Sannicola to discover its underground oil mill, then Tuglie with its amazing “rural culture museum”. Then we ride through Neviano, to visit the ruins of Macugno abbey, and then Cutrofiano, where you can step in the “fossil park. Organic lunch at “Piccapane” a little farm house, where Giuseppe will cook the vegetables you will have picked yourself! In the afternoon we reach Galatina where you can contemplate the church of Santa Caterina, totally painted with frescoes, in Giottesco style, and then visit the beautiful old town. Later, you stop in the vinery “Santi Dimitri”, to discover the secrets of oil and wine making…followed by a wine and cheese tasting, of course! Last day of our trip. We will admire many XIX century fortified farmhouse and villas we will meet on the way back to Lecce. We will stop in Nardò to visit its decadent baroque style old town. Next stop will be in Copertino to discover its impressive Norman castle and listen to stories about Sant Joseph of Copertino, “the hopi of flights”. Some km before Lecce, last stop at a handcraft traditional pottery, at the ‘Martina brothers’, skillful keepers of this ancient art. By the end of the afternoon, we will have a long dinner in one of the best restaurants in town. 7 overnights stays, in single/double room, in villas, resorts or farmhouse. 3 tasting with wine, cheese and local products. bike rental with accessories (hybrid bikes 21 gears).